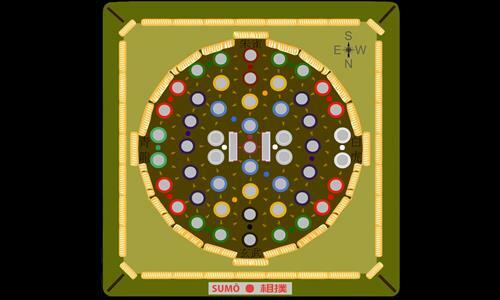 A simulation of sumo techniques and strategies. Territory names: www.sumotalk.com/glossary.htm. Review by Olorin on 3/27/2012. The map is a little deceptive as the connections are not obvious. It can be quite difficult and balance can be maintained between multiple players. Overall it has a high entertainment value which actually suprised me. Review by [REGL] Pooh on 3/27/2012. Great 1v1 Map. As an exception to my normal hatred of light fog, it seemed appropriate on this map. Review by Angriest Angel on 3/18/2013. I didn't think i would like this map, since it is so open. I was pleasantly surprised with its quality and depth of strategy it required. 5 stars easily. Cool concept. I like it, but the bonus levels are too small. I recommend that players boost them to make the game go a little more quickly. Review by Rabdo on 7/10/2015. Review by VaporWolf [FROG] on 5/6/2014.